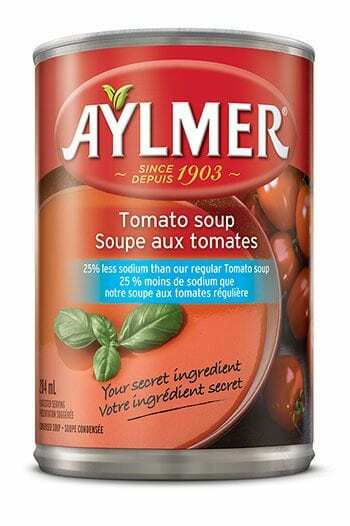 Aylmer Less Sodium Tomato Soup contains 25% less salt than our Classic Canadian Tomato Soup. This soup is made with the finest selection of Roma ripened tomatoes, slow cooked to create a delicate flavour base – the perfect foundation from which to build a variety of appetizing home-chef recipes. In a large pan, brown the chicken pieces in butter with the garam massala and garlic. Add the ginger, condensed Aylmer Tomato Soup and yoghurt. Bring to a boil while stirring. Allow to simmer on low heat for 10 minutes. Serve with rice. Brush both sides of the zucchini planks with olive oil, then sprinkle with salt and pepper. 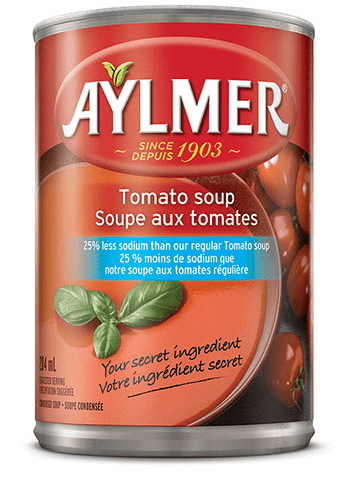 Blend condensed Aylmer Tomato Soup and herbs. Spread a 1/4 cup of the sauce over the bottom of the dish. Blot any excess liquid off of the cooled planks of zucchini with paper towel. Spoon roughly a tablespoon of the ricotta filling onto one side of the zucchini and spread it evenly. Roll up the zucchini planks and place them seam side down in the casserole dish. Top the zucchini rolls with the remaining sauce and shredded mozzarella cheese.